Looking through these papers, it is easy to see why the Charlotte Post has become such an enduring institution. In nearly every paper, the Post covers local politics, national news, local events of note and more. 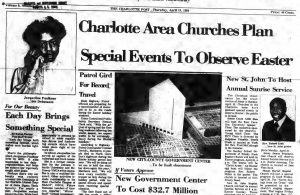 For example, on the front page of the April 1984 paper shown above, there are articles on a new City-County Government Center to be constructed, travel records for highway patrol officials, holiday plans for local churches, an interview with the 1984 Delta Sigma Theta sorority debutante, and more. 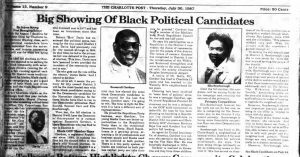 An article in July 1987 highlighting the number of black candidates running for office that fall. This new batch gives us a more complete picture of the important issues that the Charlotte Post has covered in the past as an important fixture for Charlotte’s minority community. To learn more about Johnson C. Smith University, visit their partner page or their website.